In 1996, the crime rate in Japan recorded the highest number of crimes since the end of the Pacific War, at 2,465,503 cases, after which a new record was set each year, until the peak was reached in 2002, at 3,693,928 cases. During this period, the media such as newspapers and television proclaimed the breakdown of the myth of safety in Japanese society and the sense of anxiety and insecurity among citizens rose sharply. However, although the media have not widely broadcast the fact, crime in Japan began to fall after this. After peaking in 2002, the crime rate has continued to fall every year since then, falling to 2,015,347 cases in 2012 (most recent data available from the White Paper on Crime). This means that over the past 10 years, crime in Japan has fallen by 45.4%. As this figure from the White Paper on Crime (Japanese) indicates, the steep rise and fall in the crime rate around the peak in 2002 follows a path resembling that of a rollercoaster. As anyone looking at this probably wonders, what, then, has caused this sudden rollercoaster-like rise and fall in the crime rate? This is precisely the sort of question that my academic areas of specialization, criminal policy and criminology, exist to try to answer. But in fact, it is extremely difficult to provide a clear answer, and answers to this question remain divided, even among experts in the field. First, views are divided about the first half of this rollercoaster-shaped rise and fall, in other words, the sudden rise in the crime rate in the first half of the period until 2002, into two main theories which can be called as the “Excavation effect” theory and the “Actual rise” theory. Statistically, it is strange that there should be such a sudden rise in crime. This is the starting point of the “excavation effect” theory, which argues that most of this increase is just a matter of appearance. So what, then, has created this “appearance of an increase?” The theory focuses on the criticism directed at the police response (including the refusal of receipt of the offense reports) in the Okegawa stalker murder case in 1999, and the subsequent change in police policy to “proactively” receive offense reports and respond to consultations from victims of crime. According to the theory, the appearance of a rise in the crime rate (the number of crimes recognized by the police, etc.) at this time was created largely by an “excavation effect” due to this. In contrast to this, the “actual rise” theory argues that, the rising trend until 2002 began before the change in police response and therefore that the rise in this period was not merely the appearance of an increase, but mostly an “actual rise” in crime. The cause of this actual rise in crime offered by the theory is the social and economic changes that occurred during this period, and in particular, the rise in unemployment. Views are also similarly divided on the second half of the rollercoaster-shaped period, that is the sudden fall in crime since 2003. First, if one tries to maintain consistency with the “Actual rise” theory about the first half of the period, the obvious theory would be an “actual fall” theory about the second half. However, while this theory appears to be plausible to some extent in the first half of the period, crime has continuously fallen despite the unemployment rate remaining high (contrary to the assumptions of this theory), thus making it difficult to maintain this theory and attribute a fall in crime only to the impact of the unemployment rate. In addition, if one tries to maintain consistency with the “excavation effect” theory about the first half of the period, by arguing that the change in the second half was just an “appearance of a fall in crime,” one would need to find a cause to produce the opposite effect to an “excavation effect” for the second half, to have caused the crime rate to appear to fall. Of course, you can switch the argument to one that there was an actual fall in crime in the second half, the question of “Why has crime fallen?” would then remain. 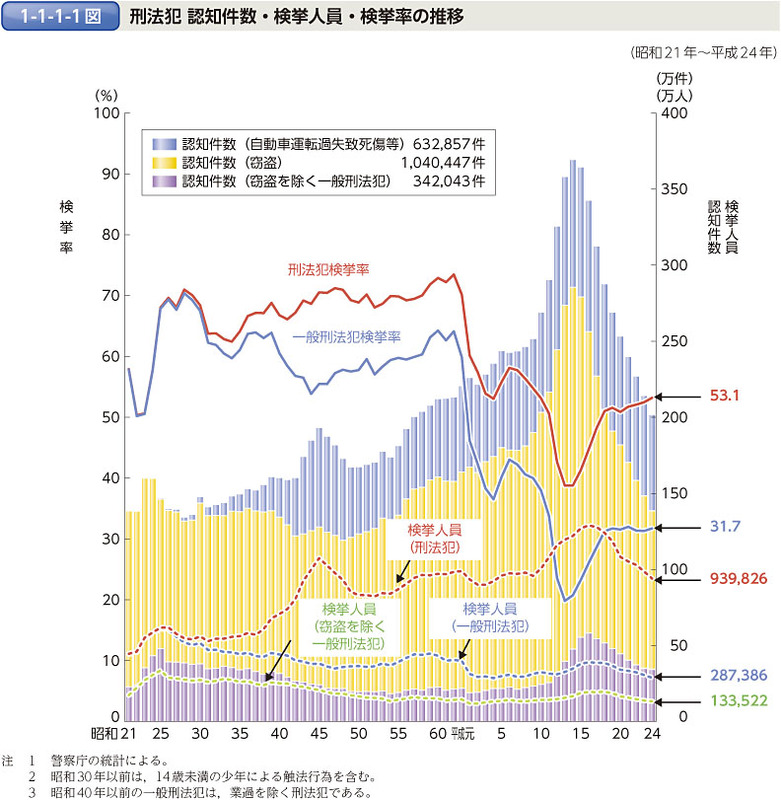 In fact, the trend of a fall in crime is not limited just to Japan. In recent years, there has been a marked overall trend of a fall in crime in the US and Europe too. Thus, naturally, many researchers in many countries are now considering the question of “Why has crime fallen?” in many different ways, but no decisive answer has yet been found. If you are interested in this issue, why not enter this academic field and join us in solving this important puzzle (which is likely to remain unsolved for some time)? Completed the Master’s Program at the Graduate School of Law, Chuo University in 1981. Master of Law (Chuo University). Withdrew from the Doctoral Program at the Graduate School of Law, Chuo University in 1986. Senior Researcher at Japan Urban Security Research Institute (JUSRI), and Associate Professor on the Faculty of Business Administration, Osaka University of Commerce, before appointment to his current position in 2012. Specializes in Criminal Law (Criminal Policy and Criminology). His current research topics include risk society theory, culture of insecurity, crime prevention, etc. His main published works include “Between the Rational and the Emotional: Punitiveness in the Risk Society,” Japanese Journal of Sociological Criminology Vol. 31 (2006), and “Construction of the Ideal Victim: A Hierarchy of Innocence and Vulnerability” The Chuo Law Review Vol. 118 (9/10) (2012), among others.